Bryan Cranston daydreams about projects he's really attracted to. "I know that's a good sign," he told KPCC's The Frame. "It stayed with me, it resonated,"
The L.A. actor is starring on Broadway in a stage adaptation of the 1976 movie Network — it made its way into Cranston's daydreams right away. Network premiered in London last year and was adapted for the stage from the Academy Award-winning script by the legendary Paddy Chayefsky. In New York, as in London, Cranston stars as Howard Beale — a TV news anchor who is fired from his job due to low ratings. His firing couldn't come at a worse time. "He's an island unto himself," Cranston said of Beale. The newsman is widowed, childless, alone. Rather than connecting with other human beings, Cranston realized that Beale "had to invest in his aloneness, and that deepens his sense of depression." Beale gets mad — mad as hell. He encourages the audience to get mad too. It's a scene made famous by the original Howard Beale, actor Peter Finch. "The most important thing that any storyteller whether you're on stage, or film, or television, is to elicit an emotional response," Cranston said. "When we get the audience to say I'm mad as hell, I'm not going to take it anymore, it's giving them permission to be angry, as a legitimate emotion." Cranston sees anger as an appropriate emotion at this time in history. "Anger does stimulate activity." He cites antiwar protests in the 1960s as a historical example. "Activism is important. Movements are important." The kids in Parkland, the #MeToo movement, the Women's March, Black Lives Matter — all important, Cranston said. "And a lot of that comes out of rage, out of anger. And if placed and directed properly, it can be an incredibly useful tool," Cranston said. 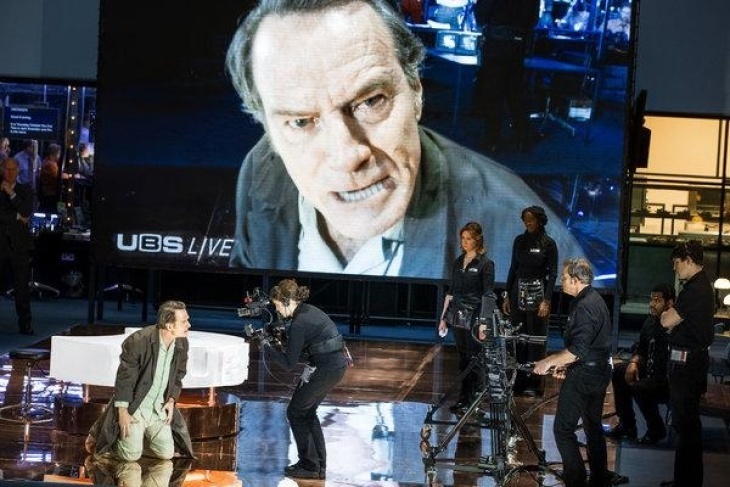 "THE TUBE IS NOW A TV THAT YOU CAN HOLD IN YOUR HAND"
The stage production of Network is an immersive experience. Some audience members are seated on stage, and actors interact with the audience seated in the house. The tension of live theater is, of course, that anything can happen — and often what happens is contradictory to the show's message. "About once a week, I see someone pull out a phone and try to take a picture of me while I'm in the audience," Cranston said. If he's close, Cranston takes the phone out of their hands and says something like, "Well, that's a strange looking cigarette holder, but thank you for not smoking in the studio." He wants them to just listen and look. This gets at the heart of what Cranston believes Chayefsky was saying in his script, that television was a magnet drawing everyone's attention. It's an addiction. "Now, it's far worse," Cranston said, "because that tube is now a TV that you can hold in your hand. And it's not just a TV. It's your schedule maker. It's your typewriter, it's your radio, it's your camera — it's all these things. It's an amazing tool. But we have to remember that it is just a tool." "THAT WE COULD BELIEVE ANYTHING ABSOLUTELY, IS PROBLEMATIC"
It's hard to watch Network in 2019 — either the play or the film — and not find it eerily prescient. Beale (and through him, Chayefsky) comes across as a prophet. When Hall adapted Chayefsky's script for the stage, he added a section near the end of the play that was an amalgamation of things Chayefsky had said about why he wrote Network. Cranston summed it up. "The thing that we need to fear the most is the outstanding damage and power of absolute beliefs. That we could believe anything absolutely, is problematic." We have to be willing to change our minds, and to believe others can change theirs as well. Cranston used the example of fake news and the ways that technology enables its proliferation. "You don't read the newspaper or read books. You're just addicted to what comes over the tube because it is the easiest way to live," he said. "We have to fight against going the easy route and keep asking ourselves, what is the best route? Not what's easy. What is the best for humankind, for showing compassion toward our fellow beings?" "The only total commitment any of us can have is to other people." In Network, Cranston reinforces that commitment every night. Network runs through June 8 at the Belasco Theater in New York.